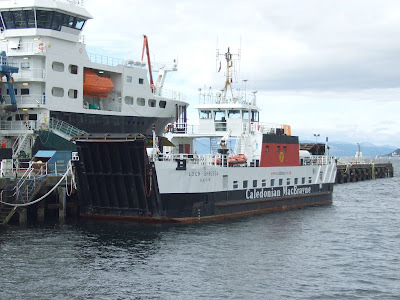 CalMac's spare ferry LOCH BHRUSDA has lain at Fairlie Quay since she had a spell of relief duty on the nearby Largs-Cumbrae Slip service during July, following a breakdown of the new LOCH SHIRA, the main ferry on that crossing. LOCH BHRUSDA was herself replaced in June on the Sound of Barra service, which links Barra and Eriskay, by the former Cumbrae ferry LOCH ALAINN. Also berthed at Fairlie Quay is the Natural Environmental Research Council's ship JAMES COOK. She was built in Norway by Flekkefjord Slipp & Maskinbabrikk AS, and replaced an older vessel, CHARLES DARWIN, in August 2006. Capable of operating worldwide, this ship undertakes continental margin and deep ocean research projects. 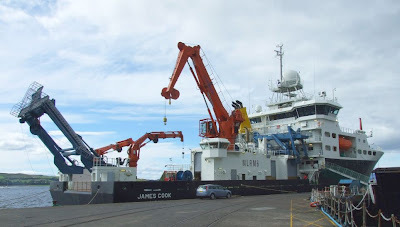 Measuring 89.5m overall, JAMES COOK carries 22 crew and up to 32 scientists. She (he?) was named at Southampton in February this year by HRH The Princess Royal. The diesel electric machinery powers Dynamic Positioning thrusters to give exceptional control and manoeuvrability, and allow the ship to hold a stable position to within one metre of a given point - crucial for deployment of scientific equipment and gathering of samples.